Hello everyone! I have a wonderful project for you that will absolutely brighten up your home or garden! Have fun creating! These striking candle holders have a rugged yet elegant shape, and are a great addition to your outdoor area, or on your dining room table. The delicate shape is made from using a balloon as a mold to cast concrete, creating an unusual shape. Each mold will be unique, and there’s no limit to the shape variations you can achieve with this method of casting. Sieve the concrete to remove all the large and medium aggregate, leaving the cement and small aggregate. Remember, the size of your balloons will be the size of your candle holder. Fill the cups about 1/3 of the way with the saved aggregate that was removed from concrete earlier. This will act as a base support for your balloon while making and drying. This will make it easier to work with. Then with painter’s tape, tape the balloon to the cup as shown above. The easiest way to work with concrete and unusual molds is to use your hands. There’s no tool that can match the dexterity and familiarity of your fingers, just make sure to wear gloves, as concrete will burn skin. Gently plop gobs of cement on the top of the balloon, then tap the balloon to settle the concrete and spread it out. Continue adding more concrete to the top and tapping until the concrete starts spilling over the sides and down towards the cup. If any small sections of concrete start creeping faster than others you can carefully push it back upwards to prevent it breaking off. However, there really is no wrong way to do this, so let your design take whatever shape you like. After concrete application let cure overnight. The balloon mold is thin and has a large surface area, so the concrete cured fast. The balloon has pulled away a little from the cured concrete casting, and you may be able to pull the balloon out. However, it’s easier to remove and less likely to break the fragile casting if you just pop the balloon. Wear a face mask and eye protection, as the balloon can spray fine particles when it pops. After removing the balloon carefully clean the inside of the concrete candle holder with a damp cloth. Be gentle when handling the thin concrete castings, even though they are concrete they are still fragile. Even if a small portion of the candle holder breaks off it won’t really matter, the irregular sides and organic shape of the concrete lends itself to minor mishaps. Painting the insides is an optional step, but will really elevate the look of the piece. From a functional perspective, lighter colors will help reflect light and make the concrete candle holders look even brighter. You know how I love sparkle! Metallics will give off even a prettier glow.I like the idea of glowing orbs in my garden, so I chose a metallic brush-on acrylic paint for my candle holders. Spray paint would also work. Any metallic or glitter paint would be a great choice for the interior paint. Don’t these look pretty! Here you see regular tea lights. But if you use, and I do with all my candles inside and out, led flameless candles with a timer you won’t have to turn on and off every day. And here they they are finished. These look beautiful at night sitting in your garden all lit up. Wouldn’t these be pretty sitting on your table! 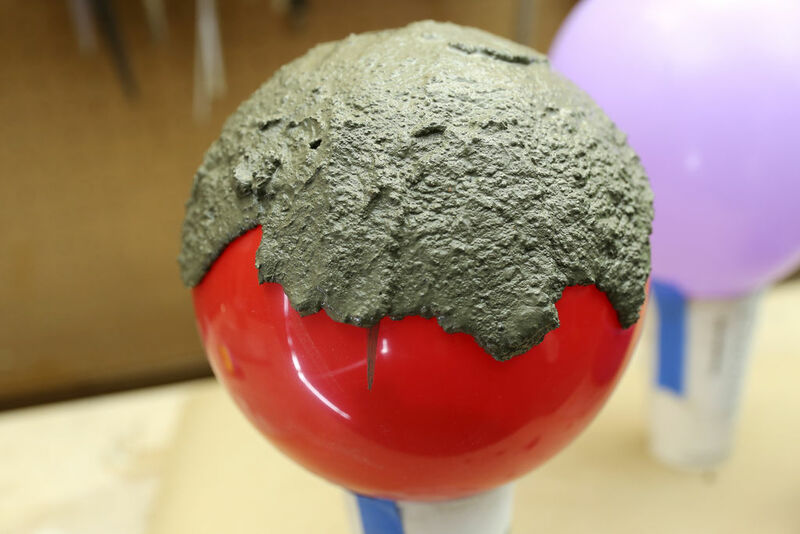 Using a balloon as a mold for concrete is deceptively simple, yet has a very big payoff. This is just one example of how you can use everyday items as a mold to hold and shape your concrete as it cures. Have you ever made a concrete mold? Love to hear about your project!! It’s a great alternative. Thanks. I remember blowing eggs out….do you remember that?? Yes, it’s been a while though. You’re so creative! I love these! That’s okay…no worries! Have a great evening! They look like little fallen stars in the dark! This is soo cool! I love this project! In my perfect world I’d say absolutely! But realistically I am so busy I don’t know if I have time.. I did save it tho and I think this would make a great project for Ryan to do with the boys for Mother’s Day! I showed it to him too… could you tell me what colors you used because that candle lit photo is stunning! And I’d want mine just like that! Metallic Gold, Bronze, Rose Gold you can find them at Walmart inexpensively. Gorgeous colors, These will be out by my pool this summer.. Thank you Kelley! I will tell the boys this is what I want for Mother’s Day! Oh, that is so sweet! Gotta get a picture of them making these…perhaps dad can take one so not to ruin surprise for you! I love seeeing their faces when they are really concentrating on a project. One of my sons, would always have a bit of tongue out when concentrating. I remember in a big soccer game. My son was making a free shot on the goal….the newspaper caught the pick of him kicking it in the goal….tongue out a bit! Made my day seeing that in the newspaper! Lana, I used the Folk Art Metallic paints. Rose Gold, bronze, Gold. You can even try silver. Check out the metallic’s…there aren’t that many colors. These are so pretty though. Mine are going out by the pool. omg thanks never thought of that. Your so welcome Jocelyn. I have so many ideas, Since I’ve been down they have been circling around in my head! I write it down and try to draw it…getting to be a long list. I just completed building my first wood project. It’s a cheval standing mirror. I made it for my granddaughter!